The thermometer climbed above 80 on Sunday and the green chile at the People’s Fair had more than a kick to it, but it’s the Colorado Rockies that are the hottest thing going these days. Even though they were playing in perfect 67-degree weather out in San Diego, you could practically feel the heat from this squad all the way back in the Mile High City. With a 3-1 victory over the Padres at Petco Park, the Rockies moved back atop the National League West and will stay at least tied there until Tuesday when they return home to face the 2016 AL Champion Cleveland Indians for two games at Coors Field. You can bet The Rooftop will be rocking on Tuesday night. Colorado is off to its best start in franchise history, setting team and individual records along the way. The buzz surrounding the Rockies is very real, and it’s growing. But it’s also distracting from some other red-hot teams in the Rocky Mountain region. As Jeff Hoffman was mowing down Padres on Sunday, Martin Truex Jr. was moving with a purpose in Dover, Del. Although he didn’t take home the checkered flag, Truex did pick up two stage wins and a third-place finish at the AAA Drive for Autism 400. If that means nothing to you, please read this next sentence carefully. For as good as the Rockies have been through the first 1/3 of their season, Martin Truex has been even better through the first third of his. Entering Sunday’s race, Truex was tied in the Monster Energy Cup Series for most race wins and was the sole leader in driver points, stage wins, stage points, playoff bonus points and laps led. He added to all of those totals in every category except wins with another elite performance on Sunday. Truex won the first two race stages and led for 102 total laps, but a caution during a pit stop forced him to fight back from inside the pack late in the race. Now halfway to the Chase, Truex holds the top spot in the Cup Series with 18 playoff points – three ahead of seven-time Cup Series winner (and Sunday’s winner) Jimmy Johnson. In addition to his two wins, Truex has three top-fives and a total of nine top-10s in 13 races. Take notice. The No. 78 Toyota Camry has been the best car in NASCAR so far this year with Truex behind the wheel. 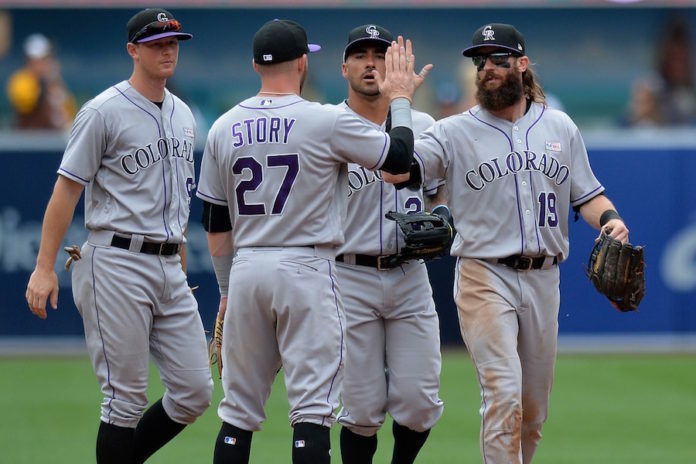 While Trevor Story and Tony Wolters were coming up with clutch two-out base hits to help lead the Rockies to their NL-best 35th win, Alex Belzile and the Colorado Eagles were preparing for Game 3 of the Kelly Cup Finals. Belzile, who leads all skaters with 26 points in the ECHL playoffs entering Sunday’s game, has the Eagles on the precipice of their first league title since joining the ECHL in 2011-12. His teammate, Matt Register, the ECHL Defenseman of the Year, is second in points and has been absolutely clutch in the Finals. His game-tying goal with :24 seconds left in Sunday’s game set the stage for a dramatic overtime win. The Eagles are now on the verge of making team history, but that’s nothing new for this club. Earlier this year they rattled off a record 17 consecutive wins that stretched from late January into early March. They’ve been cruising through the ECHL playoffs, as well, dropping just four games total in three series en route to the Kelly Cup Finals. Success is nothing new to the Eagles. They won a pair of President’s Cup championships while in the CHL and have never missed the playoffs once in either the CHL or the ECHL. Playoff success in the ECHL has been a little tougher to come by, however. In five previous trips to the Kelly Cup Playoffs, Colorado had never even won a series. Now they’re just one win away from winning it all. And they’ve done with a first-year head coach in Aaron Schneekloth at the helm. They’ve had a flair for the dramatic along the way. Like the two game-tying goals they’ve scored in the final minute of regulation so far in the Kelly Cup Finals, and the six overtime wins they have so far in the playoffs. The Eagles are a fun bunch to follow. And they’re one win away from a championship. While Greg Holland was busy locking down his MLB-best 21st save on Sunday, the Denver Outlaws could sit back and relax knowing they’re still the best team in Major League Lacrosse. The defending MLL champs picked up their fourth road victory of the year, running their overall record to 5-1, with a dominant fourth quarter against the Boston Cannons on Saturday. Denver has a pair of players, Mike Bocklet and Matt Kavanagh, in the top-5 in scoring in the league. Goaltender Jack Kelly ranks second in the league with a 9.67 goals against average (and the player in front of him has played half as many games). As a team, Denver’s faceoff percentage and shot percentage both rank second in the league. Their attendance ranks second in the league, as well. This Outlaws team is every bit as good as the squad that won it all last year. Don’t wait for the annual July 4 fireworks game to get out and support the Outlaws. They’re playing just as well as the Rockies and defending a championship. Get out and support them on June 17 when they host Boston. Don’t just read about the Eagles’ Game 4 result here on Mile High Sports. Head up to a watch party in Windsor on Monday night. Some of these players could end up in Avalanche sweaters some day. Say you saw them win a title for Colorado before that. And don’t sleep on Martin Truex and Furniture Row Racing. Book your trip now to the Kansas or Arizona races later this year. They’re both part of the Chase. If Truex stays as strong through the rest of the season as he’s been so far, those two races will be very important. Yes, the Rockies have captured our attention in a very good way through the first two months of the baseball season. But let’s not take our eyes off these other three outstanding teams bringing the heat in Colorado right now.